Usually ships within 10 day(s). 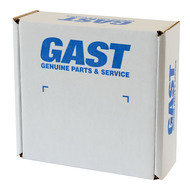 Gast AJ151G 10 micron intake filter assembly used on R6, R6P and 7H series regenerative blowers. Includes filter housing as well as the filter element. replacement filter element: AJ135G 2 1/2" NPT ports.